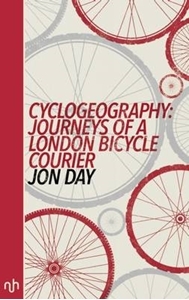 Cyclogeography is an essay about the bicycle in the cultural imagination and a portrait of London seen from the saddle. Informed by his years spent as a bicycle courier, Jon Day reflects on the way bicycles connect people with places. Parasitic on the city, couriers have an intimate knowledge of London, and for those who survive the grinding toughness of the job the bicycle can become the only thing holding them together.